Home » Music Reviews » Hear O Israel: A Prayer Ceremony in Jazz or How to keep the young at the synagogue. Hear O Israel: A Prayer Ceremony in Jazz or How to keep the young at the synagogue. Look what landed in my letterbox last night! 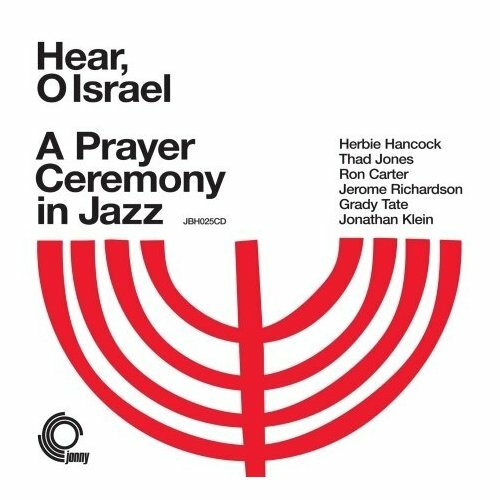 Led by Herbie Hancock, this ‘Prayer ceremony in jazz’ was recorded and released privately in New York during 1968, featuring performances by Jerome Richardson, Jonathan Klein, Thad Jones, Ron Carter and Grady Tate, with readings by Rabbi David Davis and sung texts from soprano Antonia Lavanne and Contralto Phyllis Bryn-Julson. This album provides a very different slant on what we’d normally associate with the spiritual jazz genre: this album fuses the modernity of urban jazz with the devotional words and ideologies of Judaism, and while on paper that sounds ever so slightly ludicrous, the record itself is very beautiful and without doubt amongst the more accessible ‘obscure’ jazz reissues you’re likely to encounter. Privately pressed in 1968 and only available at certain East Coast synagogues, it first came to Mr. Trunk’s (re-issuing label) attention 30 years later, at which point it was notable mainly as one of the most obscure entries in Herbie Hancock’s discography. It might not be entirely appropriate to even term this as a reissue at all. The original pressing of the album was in minuscule quantities, with nothing so official as a catalogue number or actual distribution behind it, meaning that this Trunk release marks the first time this LP has ever been granted a proper outlet. One final thing to mention about this most unusual of recordings, is that the music was written by a boy aged just seventeen. In addition to penning the score, Jonathan Klein performed on the record, contributing French horn and baritone sax. Apparently soon after the recordings were published he went on to study at the prestigious Brown University and Berklee School Of Music, but beyond that you’ll have to do your own research. These days The jonny Label appears to have been lost to the land of lost internet sites, but you can still grab your hot little copies via Boomkat. The project began in 1965, when a teenager named Jonathan Klein accepted Rabbi David Davis’s invitation to compose some music for a service. How the set came to be recorded by some of the day’s first-call jazz musicians and a couple classical singers remains a mystery, but they don’t sound like they’re slacking too much. 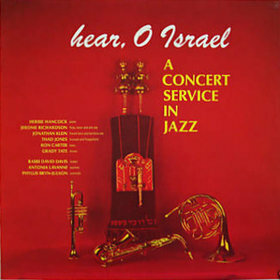 In particular, Hancock sounds great, uncorking a fleet solo on “Sh’ma” and effortlessly swinging on “Torah Service – Adoration.” Also on “Torah Service – Adoration,” saxophonist Jerome Richardson uncorks an alto excursion that sounds like it was meant to cut through cigarette smoke and chatter, not incense and prayers. Thad Jones takes a while to get started, fluffing some notes on the former track but negotiating some tricky charts and solo opportunities with aplomb. As a composer, Klein comes across more like a vocal arranger; the tunes are generally minimal launch pads for the players, but the singers’ parts are intricate to a fault. If broad interval jumps in high pitches raise your hackles, there are parts of this record that’ll make you want to leave the service early. But if enjoy records likeAndrew Hill’s Lift Every Voice and Max Roach’s similarly titled Lift Every Voice And Sing, this one should be right up your alley. And while we’re all talking about it, check out luscious Jonny Trunks site. You won’t be sorry I promise. Hi Lisa, I’ve just listened to this album again – I got it when it came out a few years ago, but have only listened to it a couple of times. I think maybe it was the attraction of it being a ‘lost’ album which appealed to me at the time but I do love Kiddush – best track on the album, very easy listening style moddern jazz (I first heard the track on the Trunk compilation cd ‘Now We Are Ten’). I’m listening to a couple of Trunk cd’s at the moment (Trunk is full of interesting and obscure stuff) – one is ‘Rising Stars’ by Michael Garrick (who passed away just the other month actually) early 60’s modern British jazz, another is ‘The Seasons’ by the Radiophonic Workshop (a record for primary school drama classes from 1969) and Mike Sammes Singers ‘Hymn’s A’Swinging’. Might be worth a listen if you haven’t already…. Hey PC – thanks so much for the tip. I like the disc the more I play it. It does take a bit of acquired listening, but the jazz is so good, I don’t mind letting the tunes take me far away. I agree about Trunk – mighty big love from me there – I’ll check out your suggestion because It sounds brilliant. Any time you have any music suggestions I’d love to hear them. Thanks heaps for the comment.